When we designed our OpenStack cloud at SWITCH, we created a network in the service tenant, and we called it private. This network is shared with all tenants and it is the default choice when you start a new instance. The name private comes from the fact that you will get a private IP via dhcp. The subnet we choosed for this network is the 10.0.0.0/24. The allocation pool goes from 10.0.0.2 to 10.0.0.254 and it can’t be enlarged anymore. This is a problem because we need IP addresses for many more instances. In this article we explain how we successfully enlarged this subnet to a wider range: 10.0.0.0/16. This operation is not a feature supported by Neutron in Juno, so we show how to hack into Neutron internals. We were able to successfully enlarge the subnet and modify the allocation pool, without interrupting the service for the existing instances. In the following we assume that the network we are talking about has only 1 router, however this procedure can be easily extended to more complex setups. What you should know about Neutron, is that a Neutron network has two important namespaces in the OpenStack network node. The qrouter is the router namespace. In our setup one interface is attached to the private network we need to enlarge and a second interface is attached to the external physical network. The qdhcp name space has only 1 interface to the private network. On your OpenStack network node you will find that a dnsmasq process is running bound to this interface to provide IP addresses via DHCP. In the figure Neutron Architecture we try to give an overview of the overall system. A Virtual Machine (VM) can run on any remote compute node. 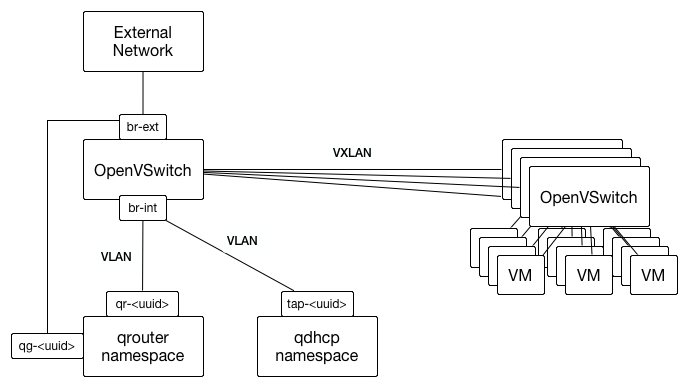 The compute node has a Open vSwitch process running, that collects the traffic from the VM and with proper VXLAN encapsulation delivers the traffic to the network node. The Open vSwitch at the network node has a bridge containing both the qrouter namespace internal interface and the qdhcp namespace, this will make the VMs see both the default gateway and the DHCP server on the virtual L2 network. The qrouter namespace has a second interface to the external network. Again filter for the service tenant. We take note of the router ID. At this point we have all the information we need to enlarge the subnet in the Neutron database. Nothing will happen immediately after you update the values in the Neutron mysql database. You could reboot your network node and Neutron would rebuild the virtual routers with the new database values. However, we show a better solution to avoid downtime. Still on the network node there is a namespace qdhcp-<network_id>. Exactly in the same way we did for the qrouter namespace we are going to find the interface name, and change the IP address with the updated netmask. The dnsmasq process running bounded to the interface in the qdhcp namespace, is smart enough to detect automatically the change in the interface configuration. This means that the new instances at this point will get via DHCP a /16 netmask. We called the subnet name 10.0.0.0/24. For pure cosmetic we logged in the Horizon web interface as admin and changed the name of the subnet to 10.0.0.0/16. At this point the new instances will get an IP address from the new allocation pool. As for the existing instances, they will continue to work with the /24 address mask. In case of reboot they will get via DHCP the same IP address but with the new address mask. Also, when the DHCP lease expires, depending on the DHCP client implementation, they will hopefully get the updated netmask. This is not the case with the default Ubuntu dhclient, that will not refresh the netmask when the IP address offered by the DHCP server does not change. The worst case scenario is when the machine keeps the old /24 address mask for a long time. The outbound traffic to other machines in the private network might experience a suboptimal routing through the network node, that will be used as a default gateway. We successfully expanded a Neutron network to a wider IP range without service interruption. Understanding Neutron internals it is possible to make changes that go beyond the features of Neutron. It is very important to understand how the values in the Neutron database are used to create the network namespaces. We understood that a better design for our cloud would be to have a default Neutron network per tenant, instead of a shared default network for all tenants. Categories: openstack, SWITCHengines | Tags: juno, neutron | Permalink.